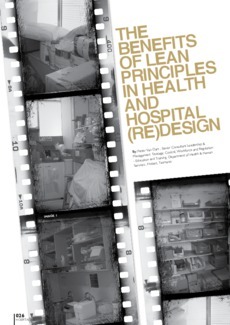 Lean begins to have an impact in hospital and healthcare (re) design. It originated in the manufacturing industry, developed by Toyota in Japan, just after the Second World War. In recent years it has been increasingly adopted by healthcare organisations as a means of improving efficiency, reducing costs, eliminating waste and in the design of physical layouts. Redesign projects have been implemented in numerous countries to address a wide range of problems and have been conducted with varying degrees of success. However, the overwhelming evidence, as demonstrated in a variety of publications, suggests that lean redesign and lean methods are effective. Not only has it achieved a reduction in patient length-of-stay, reduced emergency department waiting times, reduced costs, improvement in the safety and quality-of- care but has also improved physical work environments for healthcare professionals. Work environments that have incorporated work processes supporting patient-centred care have led to better facilities and better care delivery.